Being a fan of director David Gordon Green, who brought us the hilarious stoner comedy, Pineapple Express, I couldn't wait to see his latest collaboration. Your Highness is a tale of sibling rivalry with fantasy action sequences and bad language. 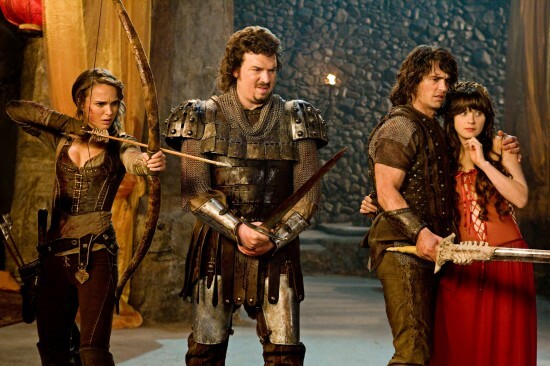 It's Krull meets Lord of the Rings meets Conan the Barbarian. Though not as funny as I was hoping, and more crude humor than I (naively) was expecting, there were definite moments that seriously had my rolling with laughter. On one hand we have Prince Fabious (James Franco), a fearless knight and champion who is often returning to his father's court with triumphant after completing quest after quest - he is clearly the golden boy of the palace. 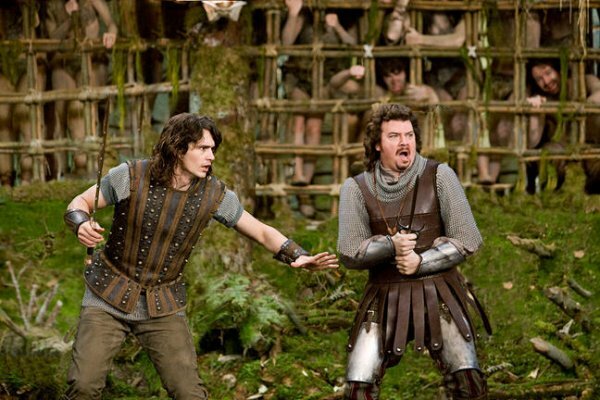 And on the other, we have his brother, Prince Thadeous (Danny McBride, who also co-wrote the film) who isn't so popular, in fact Thadeous is a lazy coward who smokes too much weed and is extremely jealous of Fabious the fabulous. We begin our story after Fabious returns from yet another quest with yet another victory. It's there we meet his soon to be bride Belladonna (Zooey Deschanel), a lovely (not too bright) waif with a good singing voice that Fabious has rescued. However, during the wedding ceremony the fair maiden is kidnapped by Leezar (Justin Theroux), an evil and seriously immature momma's boy wizard whose vile plan requires deflowering the virgin when the two moons a line in order to impregnate her with a demonic dragon offspring. Of course the honorable King Tallious (Charles Dance) forces the unwilling Thadeous to accompany his brother on the quest to rescue Belladonna. It's during their quest that they meet Isabel (Natalie Portman), a fearless warrior who is hellbent on avenging her families untimely deaths. I feel she is the only one who really didn't quite fit in this movie. She comes off, frankly, like a high-school actress - her voice thin and her accent wobbly. Of course with a comedy such as this there is always the inevitable envelope pushing. While most of the movie was indeed funny, there were one or two crude scenes I could have completely done without. 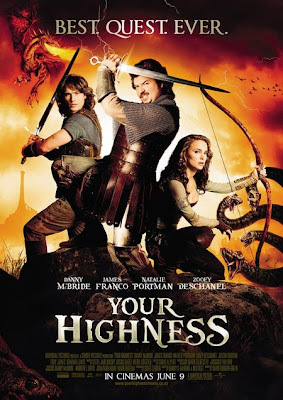 Your Highness doesn't quite match the roaring laughter of Pineapple Express, but over all I thought it was a pretty likable and funny mid-evil, comedy. If you're a fan of this genre I'm sure you'll enjoy it just as much as I if not more. McBride proves himself absolutely capable of carrying his own, while Franco puts that self-aware charm of his to great effect as the naively virtuous hero. The special effects are quiet impressive and elaborate for a movie of this caliber. Given that the movie is largely meant to be played for laughs, it would have been easy to deliberately keep the production design and special effects cheap and cheesy as part of the overarching gag. But it's that kind of attention to detail that makes this movie that much more worthy of a great laugh. or was it everything you thought it'd be and more?